I recognized her, but not for the reason you might think. She walked into my office, her two week old infant over her shoulder, infant carrier slung over one elbow, diaper bag with burp cloth falling out over the other elbow. A pacifier hanging from a robin’s egg blue ribbon dangled from her clenched teeth. “Here, how can I help you?” I offered. “Correction…a sleeping newborn baby!” she replied as she transferred her sweet baby boy to my arms, then started to disentangle herself from all the trappings of her new experience of motherhood. I helped her get settled and comfortable. As I offered the precious bundle back to her, she waved him back to me. I readily consented with my smile and took my seat in front of her. I gave her a couple moments and quietly watched as she took a couple deep breaths. That was all it took for the floodgates to open and the tears to begin flowing. I stood, picked up the box of tissues from the side table with my free hand, and set them down next to her. She looked up at me through her tears. It told me everything I needed to know. I had been her almost 20 years ago. On the outside everything was wonderful: my pregnancy had gone perfectly, labor and delivery went well, and I had what I believed to be the perfect baby. Yet I was not ok. Even when the baby was not crying, I was…all the time…over anything, over nothing. It made no sense. At least not to me. I remember wondering the same thing. Here I had what I always wanted, a sweet baby boy, a loving husband, a beautiful home and yet anyone who could see me behind the closed doors of my home might think I was anything but happy because I cried all the time. Everything seemed like an effort. I didn’t want to do anything or see anyone. I felt like a failure. Wasn’t this supposed to be the happiest time of my life? I constantly wondered, “What is wrong with me?” Surely others could see through my masked exterior and wondered the same thing. I had watched the mom and baby shows on the TLC channel…I didn’t resemble any of them. Maybe I wasn’t cut out for motherhood after all. Maybe God made a mistake. “Oh Sweet Girl, this isn’t your fault. There isn’t anything wrong with you. I know what’s going on.” I assured her. “You do?” she looked up through the strands of blond hair that had fallen down over her face as she sobbed. The first glimmer of hope finally returning to her tear-stained reddened eyes. I remembered feeling that glimmer of hope, too. My mother had called one evening to check on me and the baby. “How are you?” she asked. Just as it happened in my office with this sweet new mom, her question made me sob. It took me a few moments to regain my composure before I could explain what had been happening and my fear that I was somehow losing my mind. “Sweetheart, I think you’ve got postpartum depression. Put your husband on the phone.” She explained to my husband her suspicions, and made him promise that as soon as we hung up that he would call my doctor and ask for help, that I didn’t need to suffer any longer. And having gone through it myself, and being a doctor trained in mental health issues, I was then able to assure this new mother that she did not need to suffer any longer either. Consistent with scripture, I could comfort with the comfort that I had been given. “What is it called?” she asked, as she dried her tears. 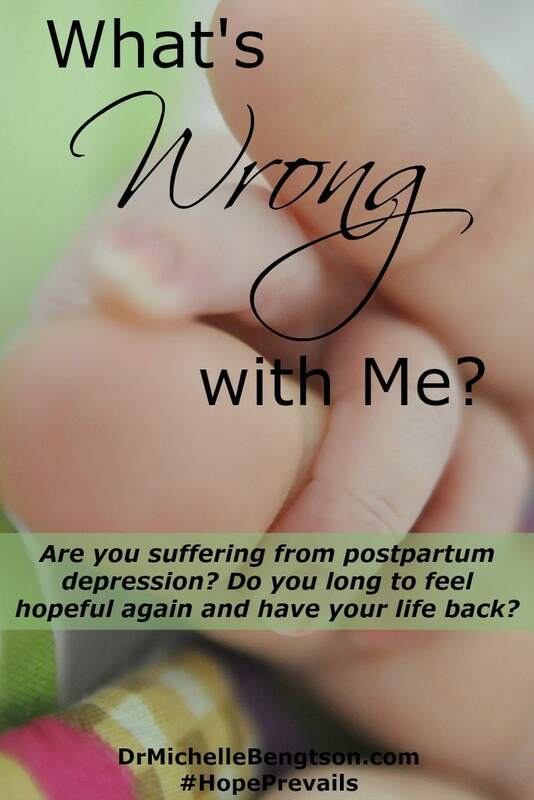 “Postpartum depression. It’s fairly common, but it’s rarely talked about. It’s not your fault. You didn’t do anything to cause it. But we can get you help for it so you can enjoy this precious baby boy God gave you.” I assured her. When I experienced postpartum depression, I had never known anyone else who had experienced it. I felt all alone. I would have given anything to hear, “Me too.” Part of what perpetuates stigma is when we don’t talk about our experiences, so they seem more rare than they really are. That’s why I now share my story—to offer help, and hope, and to help tear down the stigma so that others will know real people suffer, and so that those who suffer will know they aren’t alone. 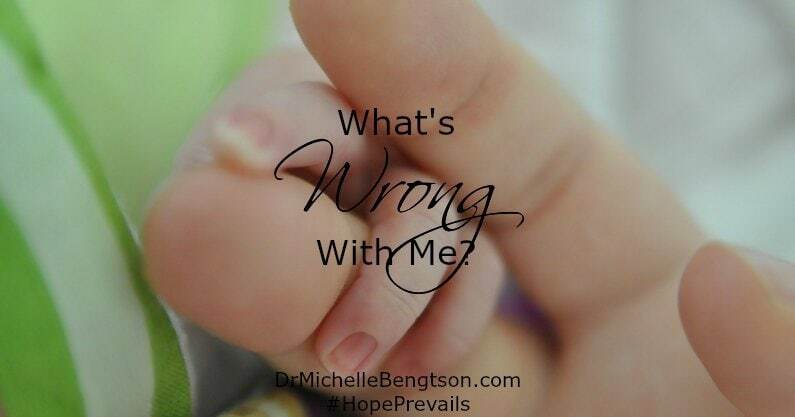 When I suffered #postpartum #depression, I felt alone. I longed to know I wasn’t. If you or a loved one have had a baby within the past year and just aren’t feeling like yourself, are feeling down, blue, or outright depressed, cry more frequently than normal, have lost interest in previously enjoyable activities, or lost motivation in doing things with others, please talk to your medical provider. You may be suffering from postpartum depression, which is a common medical condition for which there is help. You don’t have to go through this alone. There is help, and there is hope. You can also find out more about the book, “Hope Prevails: Insights From a Doctor’s Personal Journey Through Depression” below. Thank you for sharing this! I suffered for PPD 2x after the birth of my kids, although both their births were traumatic. I’m so glad you’re discussing this and giving hope to others! Thank you! It’s hard for those who suffer to feel safe opening up about PPD, but it’s such an important topic, and help is available! I’m so sorry you suffered too. I pray you are on the other side of it now. Thank you for sharing this! I suffered from PPD 2x after the births of two of my kids. Their births were traumatic and I felt alone. I’m so glad you’re addressing these issues and giving hope to others! An important message.Thank you for sharing. I struggled with PPD after the births of 2 of my children. It’s a very lonely journey. My births were traumatic and I don’t have enough time to heal before I was thrown into normal life with other kids to take care of. I’m so glad you’re breaking the silence and giving hope to others who are walking this alone. So many deal with this. Thank you for giving them some hope! Really helpful to learn about this. Thanks for offering the insight! I’ve never experienced postpartum depression, which is strange considering I’ve suffered depression at other times. Glad you can be an encouragement to moms who deal with this. 🙂 Thanks for sharing at Literacy Musing Mondays! “I had been her almost 20 years ago.” This line really stood out to me, Michelle. Whether it’s postpartum depression or something else, those of us who have gone before have a powerful opportunity to remember what it’s like and to do what you did for this mom–offer hope that it will not always be this way. Glad to be your neighbor this week at Chasing Community. Thank you Lois. I feel like it’s our privilege to share comfort with others out of our own testimony and experience. I hope this post does that. Blessings. Somehow, it was these words that struck me most deeply as I read: “…don’t need to suffer any longer.” What a gift for that young woman to hear, I’m certain. Knowing that there was a reason and help gave hope then and gives hope today. Thank you Natalie. That’s what I would have wanted to hear so many years ago. I pray that this offers hope and encouragement to some woman suffering today. Because of Him, #HopePrevails! Thank you for writing about this. I think it can be good to read. I have had a prepartum depression six times (I am a mom of six). I’ve never read about it. People used to think of pregnancy as a ‘honeymoon’ away from depression risk. Prepartum depression can make woman feel very alone too. I am so glad you can be an BLESSING. You’re right Ariella, we often hope that pregnancy will help with depression, but so often it doesn’t. What we need is love, acceptance, understanding, and support. If I can offer that hear, it is my privilege. It’s so easy to think your’e alone – that there can’t be anyone else in the world who has similar thoughts to yours. Thank you for sharing this. Debbie, I love when God opens up the opportunity to share His love and His hope from our own testimony of pain and despair. It brings beauty for ashes! I remember walking into my doctor’s office with my 2 week old baby and bursting into tears. I wasn’t diagnosed with postpartum depression but my circumstances did trigger depression, which wasn’t diagnosed for a long time. When my baby was four weeks old we moved out of house and moved country with my husband’s job. I left behind everything I knew – my job, friends, family, roots – the lot. It wasn’t until someone trained in depression at our church did a workshop and said if you cry a lot, you need help. That was me. I can put myself in your shoes and just know that adjusting to motherhood was complicated by all those other life stressors you dealt with. I’m so sorry you weren’t offered an accurate diagnosis and help sooner. I pray you are on the other side now. Thank you for sharing this. This is such an important message to get out there to new moms! I went through a bout of this after my first daughter was born, but didn’t get help when I probably should have. :/ Everything worked out, though. Thanks for sharing on the Family Joy link up! Alicia, I h ope that this post will encourage others to get the help that is available so they don’t have to suffer any longer than necessary. It’s a terrible time, but hope and help are available! This is so good!!! I think I may have had some of this after my son was born. He was the first and I had even worked in the newborn nursery as a nursing student and loved spending time with the babies but they weren’t mine. This little guy was mine, ALL BY MYSELF, during the day when my hubby was at work. I was fearful and I didn’t want to do anything wrong. Oh I pray those who have these symptoms will seek help!!! Thank you so much for sharing your experience to encourage other new moms. Love your helpful messages. Love and appreciate you Dr. Michelle! !